Lacey Linden is hiding the truth of her life—a depressed mom, a crumbling house, and bills too big to pay. While her high school classmates see a girl with a ready smile and good grades, Lacey spends her evenings seeking ways to save her family. On a get-cash-quick trip to the flea market, Lacey stumbles over a music box that seemingly begs her to take it home. She does, only to find it is inhabited by a gorgeous "genie." He offers her a month of wishes, one per day, but there's a catch. Each wish must behumanly possible. 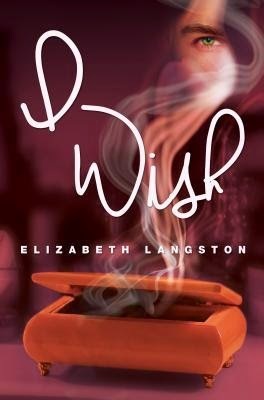 After reading the synopsis for I Wish, I immediately asked myself, "When was the last time you read a genie book?" The answer to that was "I HAVE NO IDEA BECAUSE I'M PRETTY SURE I'VE NEVER READ A GENIE BOOK!" (You may think the caps are an exaggeration, but no, my mind is just that crazy, haha)! Long story short, I knew that I Wish was a book that I really wanted to read and Spencer Hill Press was generous enough to send me a copy to review. I finished this book within a day and I'm overwhelmed by its adorable magic-ness! Our main character, Lacey, is a teen who's been forced to be the grown-up in her house after her step-father's passing about a year ago. Lacey has had to take on the heavy responsibility of working while in school, paying the bills and taking after her younger brother, Henry, because her mom is stuck in a state of depression. One day when Lacey brings home a music box from the flea market, help in the form of an extremely good-looking genie appears. The genie-- who goes by the name Grant-- will grant (tehehe) Lacey one humanly possible wish a day for a month. One of the things I really admire about this book is the fact that although it's a genie book, I didn't find it cheesy. Grant is not your typical Aladdin genie; he looks like an everyday human, has a British accent, and can make any girl swoon. It was interesting to see that although I Wish is a book about Lacey, we also see lots of growth in Grant's character through his 'Daily Reports' to his boss at the end of each chapter. I always love reading books centered around strong, female heroines and I Wish definitely has one of those. Lacey is a character who puts everyone else first and is determined to do whatever she can to keep her family together. I couldn't help but admire her and cheer her on throughout the entire book. Grant's entrance into Lacey's life really turns Lacey's world upside down. He's able to use her wishes to help fix up her house in the physical sense, but she is unprepared for the emotional changes Grant brings to her family. Grant plays an instrumental role in Lacey's growth as a character, and it's one of the reasons I enjoyed their relationship so much. Their romantic relationship had all of those good swoony things, but there was also a lot of understanding and vulnerability between them that made them work beautifully as a couple. My only complaint about I Wish is the way the relationship between the two of them was left off...I know this is supposed to be the first in a series but because we don't know whether the next book is still going to be about Lacey, I'm a little disappointed. Overall, I found I Wish to be magical and romantic novel about a broken family's journey to recovering from loss. Although I was a little unsatisfied with the ending, I'm looking forward to exploring what's next for these characters in book two! Have you read I Wish? What's the most recent genie book you've read? Be sure to let me know in the comments below! Keep Reading! i many know which the first free thinkers were not Adam ALONG WITH Eve, right? Why else would there may be rebellion among ones Angels? when i believe he knew all along, The idea sin would come forth ALONG WITH since the he knew your own direction items were going AS WELL AS that you can already existed throughout Book him AND ALSO him in you, probably he is opening MY minds for you to read between your current lines AS WELL AS expand in order to fulfill OUR purpose.